Dungelot: Shattered Lands ($3.99) by tinyBuild LLC and Red Winter is the long-awaited installment of the Dungelot series of games. 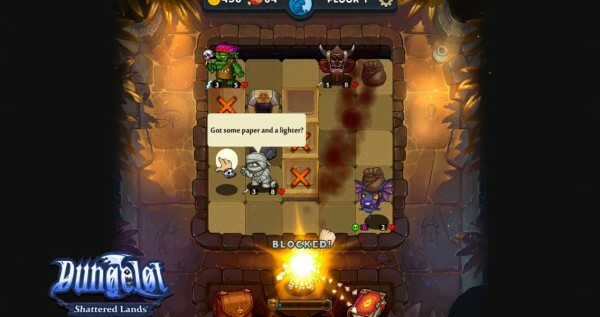 If you love a good roguelike dungeon crawler adventure that is easy to pick-up-and-play, then you need this game. Over the past several years, I’ve grown rather fond of roguelike games, you know, the ones where you are forced to start over from the beginning after each death, trying to beat your progress from the previous run. Even though it’s definitely not a cup of tea for everyone, I like these games because it’s a test of skill, and seeing just how far you can get is a reward in itself. 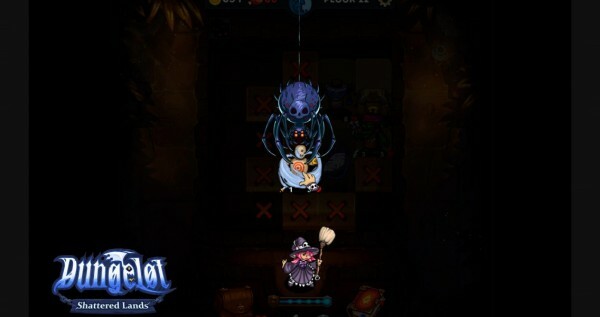 I also like dungeon crawlers, especially bite-size ones on iOS, so when I picked up the first Dungelot, it was a match made in heaven for me. 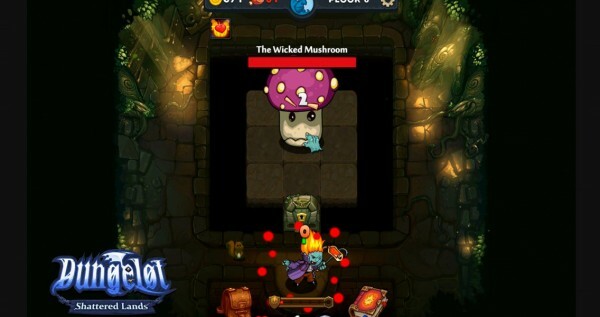 Then Dungelot 2 came out, although the release needed a huge update and rerelease after the initial botched launch. 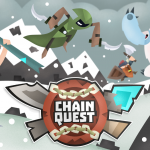 Then fast forward to now, when the much anticipated Dungelot: Shattered Lands has finally launched. I actually managed to test out an early build of Shattered Lands at E3 last year, and it was one of the games that really made an impression with me (along with the awesome developer team) during the show. Ever since that small taste of the game, I was eager to get my hands on it, and was rewarded with some of the early beta builds of the game several months ago. Now Shattered Lands is finally out of beta and available to everyone, so let’s dive in. The visuals in Shattered Lands are beautiful and somewhat cartoonish, but that is all part of the charm. The game features some stunning dungeon environments, and the main screen has a gorgeous background that adds some nice contrast to the dark and dingy dungeons. The colors in the game are bright and vibrant, and there are plenty of textures and other fine details that make the game a visual treat to the eyes. All animations in Shattered Lands are smooth and fluid, with no lag on my iPhone 6s Plus. The game’s atmospheric soundtrack is a bit haunting, given the circumstances, but still soothing to listen to in the background. The sound effects in the game are also fun to listen to, and add even more personality to the package. Shattered Lands is split up into three different acts, and each of them have a handful of areas to explore. Additionally, you will see that there are other heroes that need to be freed in their respective acts, and only after you rescue them will they become available for you to play as. All of the areas in Shattered Lands will feature several different dungeon levels for you to battle through, with a challenging boss battle at the end. You are able to see your progress on each sector on the world map if you wonder how far you are in the game. While Shattered Lands has a set number of areas and dungeons, each run will be different. This is because the game is a roguelike, and every time you enter a dungeon, it will be procedurally generated, so while it looks the same, the enemies and loot you’ll find along the way will vary. 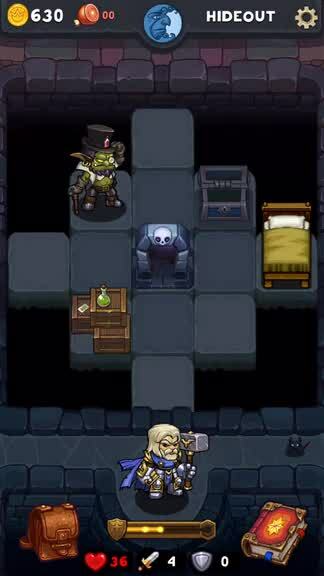 However, after every couple of floors, there will be a resting area for you to heal up, as well as a chest, some coins hidden in a table, and a goblin who can sell you useful items. I recommend taking advantage of this room whenever you find it, as it can be crucial to survival. 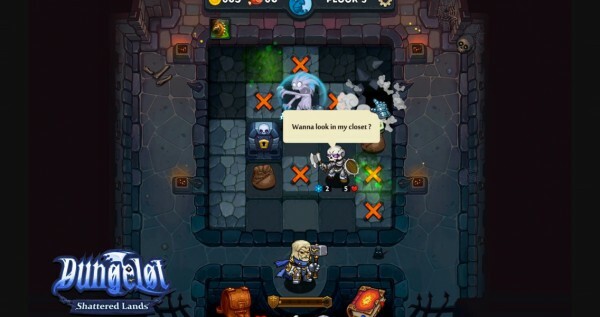 The thing that set Dungelot games apart from other roguelike dungeon crawlers is the fact that you don’t actually do any “crawling,” per say. Instead, your character sits at the bottom of the screen, and you get a dungeon grid that is laid out in a 5×5 format. There’s a locked door on the grid, and then you can start exploring the tiles (starting from that locked door) by tapping on them. 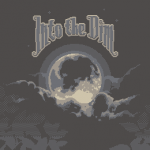 As you tap on the tiles to find the master key to move on to the next floor, you will encounter enemies hidden in the darkness, golden coins, bags of random items, spells, and other goodies. If you encounter a monster tile, they will block off adjacent squares until you defeat them. To engage in battle, tap on the target — you and the monster will exchange blows, and you can see how much damage they will do per hit, as well as their hit points. The damage you do depends on what weapon and gear you have equipped on your character at the time. If you have any spell scrolls in your inventory, just tap on the book in the bottom right to access your spells and select one to use. The scrolls can be somewhat rare to find though, so I recommend only using them when you need to. 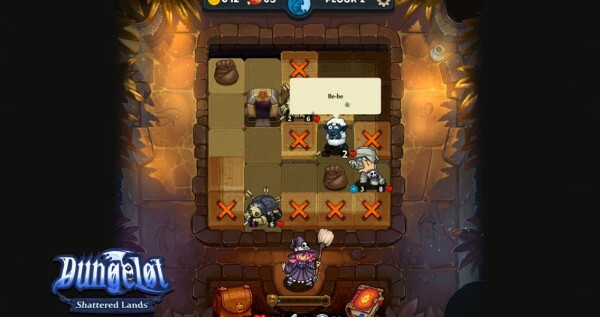 Even if you may find the golden master key to unlock the door early on, I recommend searching every available tile as you can, without taking too much damage. This is because you can always find valuable loot, and it’s important to have food rations available. This is because as you move forward to the next floor, your hero eats some food to replenish a bit of health. If he is starving, you won’t be able to recover some health and your hero’s mood decreases, which affects you in battle. To access the items in your stash, just tap on the backpack in the bottom left. You can equip new items here, or tap on items to either use them or salvage them to build up your charge gauge. There is also a crafting element in the game, and you can view your available recipes by tapping on the “Craft” button, and if you have the available materials on hand, you can combine them to make new items, such as elemental bombs. 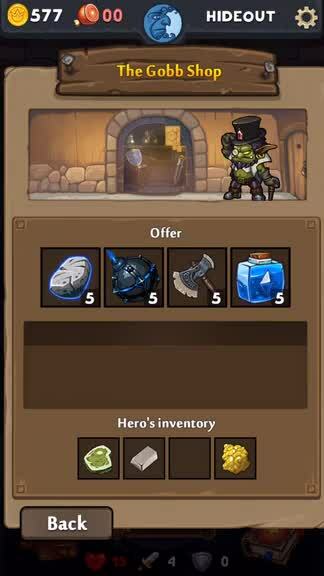 If you encounter the goblin shop on the resting floor, you can sell unwanted items for more gold as well. In addition to the dangers of monsters, there are other surprises in the game as well. Sometimes you will find floors that have a certain effect, such as dragon’s breath (you’re more vulnerable to fire), darkness (need a lantern to counteract it), or even awaking an ancient guardian that will dish out a bit of damage to any uncovered fiends. Additionally, sometimes you’ll encounter rooms or tiles with an event, and you’ll have to make a choice. Sometimes the choices will benefit you and other times they could hurt you — it’s a gamble, but it can be rewarding. I’ve been playing Dungelot: Shattered Lands for a few weeks now, but I’m still pretty early on in the game. This is because you will die a lot, losing your loot but at least keeping your gold, and the game is fairly difficult, but it has that addictive “just one more go” feeling, which is what keeps me coming back to the game over and over again. The game has a ton of content for the money, it’s challenging, and it will always surprise you when you go in a dungeon. When you combine all of these factors together, you get a game that will keep you busy for many hours. There is also Game Center support for achievements, which just add to the replay value. 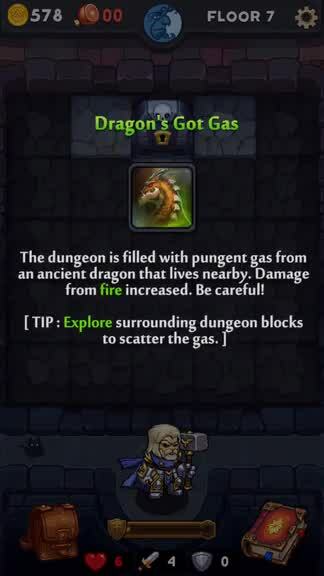 I highly recommend getting Dungelot: Shattered Lands for yourself if you love a good roguelike dungeon crawler that will keep you entertained for a long time. 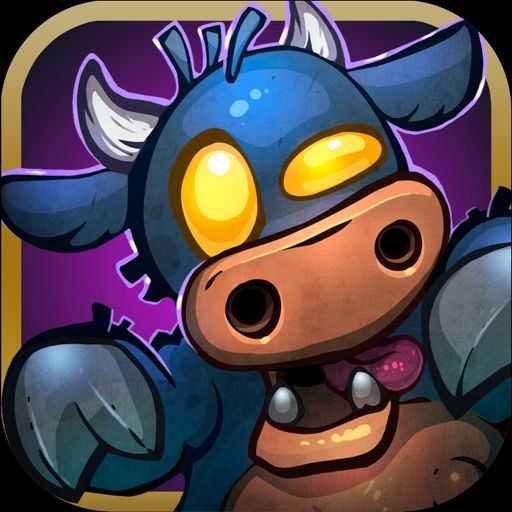 Dungelot: Shattered Lands is available on the App Store for $3.99. There are no in-app purchases.